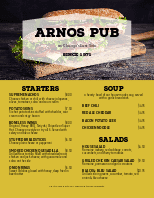 A fun, enticing bar menu can create a more memorable event for your customers, helping you to build customer loyalty. 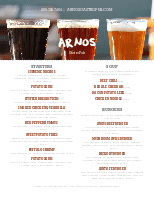 Use our bar menu templates to showcase happy hour cocktails, mixed drinks, bartender's specialties, spirits, small plates and other bar menu items. Easily customize online. Matching menu sets available.